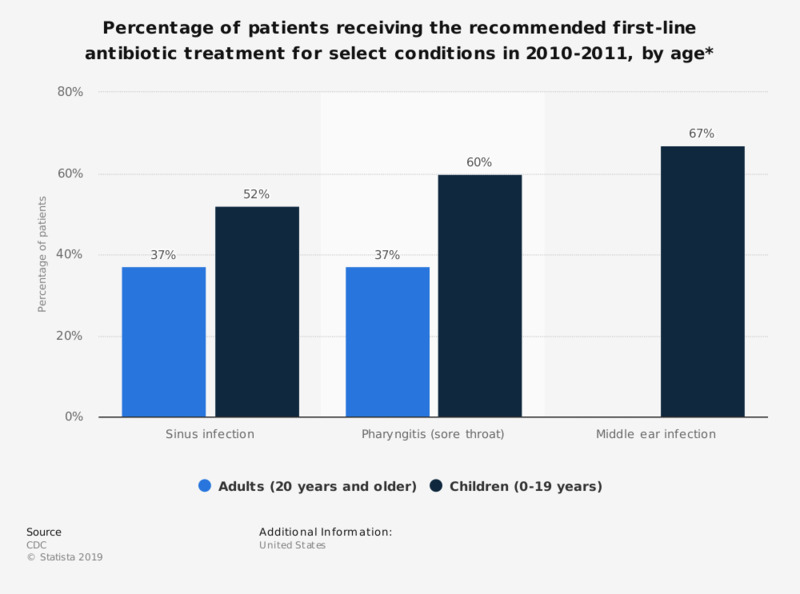 This statistic depicts the percentage of patients that received the recommended first-line antibiotic treatment for select conditions in the United States in 2010-2011, by age. Among adults, just 37 percent received the correct first-line antibiotic for sinus infections, compared to 52 percent of child patients. * Based on the prevalence of allergy to first-line antibiotics and estimated treatment failures after first-line antibiotics, at least 80% of patients presenting with these conditions should receive first-line antibiotics. Analysis is based on NAMCS and NHAMCS data. No vale means no data available.